St Sepulchre, on Newgate Street, was originally built in the early twelfth century, on the site of an earlier Saxon church dedicated to St Edmund, and originally known as St Edmund and the Holy Sepulchre, after the “Knights of the Holy Sepulchre”, who had a home here from 1103-73. And rebuilt by Sir John Popham, the Treasurer to Henry VI, in the fifteenth century, in around 1450. It was damaged in the Great Fire of 1666, and repaired, using the surviving structure and materials, between 1667-74 (although much modified subsequently, particularly in the Victorian period). The west tower and south porch still survive essentially intact from the fifteenth century (although modified). On the stroke of midnight on the day of the execution of a prisoner from nearby Newgate Prison, the church sexton would ring his handbell and recite lines urging the condemned man to repent his sins, ending with the words “And when St Sepulchre’s bell in the morning tolls, The Lord above have mercy on your soul”. 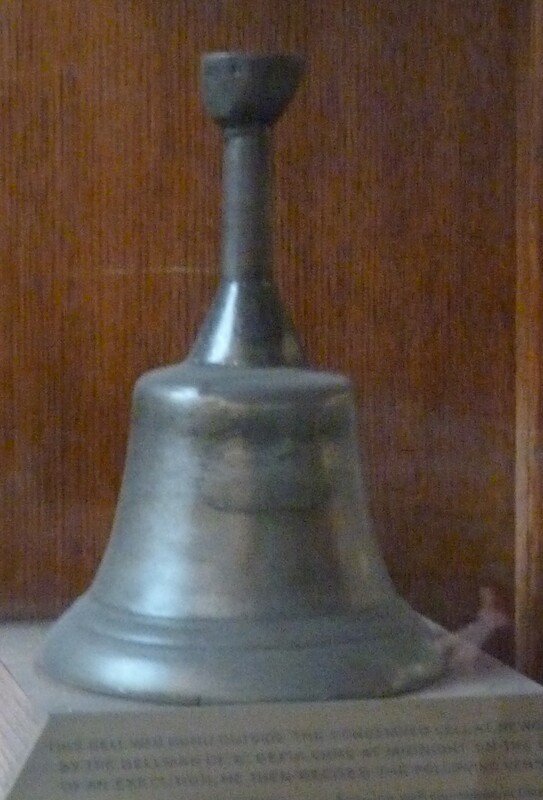 The same handbell is on exhibit in the church. This entry was posted in 15th century London, Criminal London, London churches of note outside the City of London and tagged execution, Knights of the Holy Sepulchre, Newgate Prison, Sir John Popham on March 27, 2015 by Bob Jones - The Lost City of London.